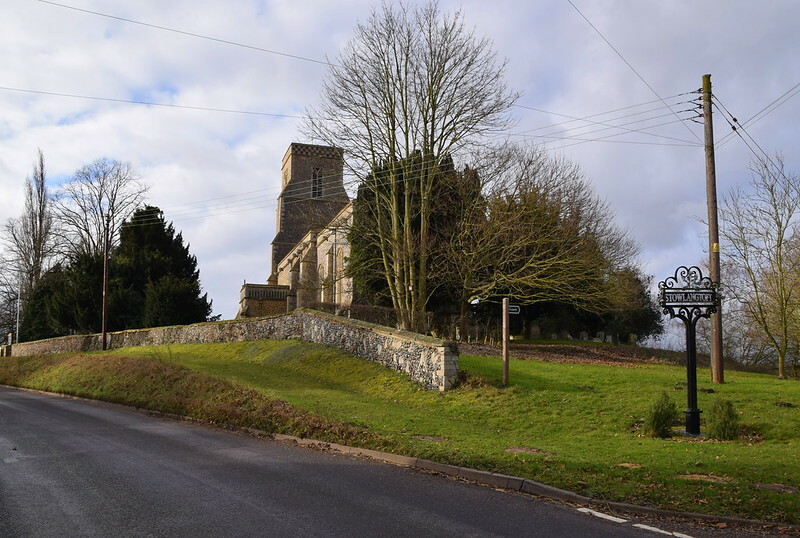 It was years since I'd last been to Stowlangtoft, almost twelve, and yet I'd often thought about it, for it is not only one of Suffolk's more interesting churches, it is also one of the most puzzling. Given that our parish churches almost without exception underwent restorations in the 19th Century, it should be obvious that when we enter a medieval church, we are encountering a Victorian vision of the medieval. Even when the actual furnishings and fittings are medieval, the whole piece is still a Victorian conception. Inevitably, the question arises of what was there before the restoration and what wasn't. The obvious answer is that we must assume that nothing is as it first appears. A prime example of a church that assumes a continuity that may not actually be the truth is here in the flat fields between Woolpit and Ixworth. This part of Suffolk can be rather bleak in winter, but in summer the churchyard here is verdant and golden, as beautiful a place as any in the county. The church is large, and yet unusually narrow. It sits on a mound that has been cut down on one side by the road. 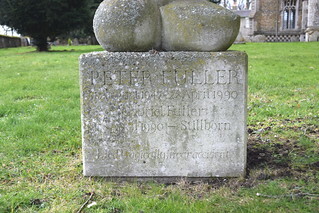 In the churchyard you'll find the well-known memorial to the art critic Peter Fuller and his unborn son, killed in a car crash in 1990. In the churchyard wall there is what appears to be broken medieval window tracery, which is also worth noticing, for hereby hangs a tale. 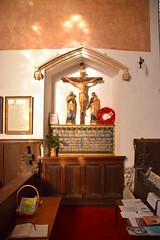 St George is one of the great Suffolk churches. Although it may externally appear a little severe, and is by no means as grand as Blythburgh, Long Melford and the rest, it is a treasure house of the medieval inside. Unusually for a church of its date, it was all rebuilt in one go, in the late 14th century, and the perpendicular windows are not yet full of the 'walls of glass' confidence that the subsequent century would see. The tracery appears to have been repaired, and possibly even renewed, which may explain the tracery in the churchyard wall. However, it doesn't take much to see that the tracery in the wall is not perpendicular at all, but decorated. So it may be that the broken tracery is from the original church that the late 14th century church replaced. But the wall itself isn't medieval, so where had it been all those years? Is it possible that the current window tracery is not medieval at all? Stowlangtoft church featured in Simon Jenkins' book England's Thousand Best Churches, which sends plenty of visitors to its locked door, and may help stave off the inevitable for a while, for there is no real congregation here anymore and the church is moribund. Regular services are held across the fields at Pakenham, and St George is now only used on special occasions. The key is kept across the road, where the very nice lady told me in February 2018 that the church is now headed for redundancy. 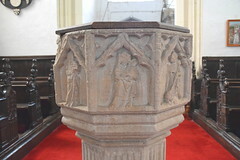 It seems likely that care of it will be conveyed into the hands of the Churches Conservation Trust. 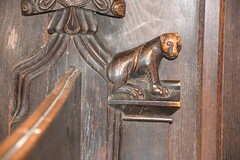 You step in through the chancel door (the lock here is very awkward, but do persevere) and if you are anything like me you will head straight down to the west end where you will find the font. Like the window tracery, it asks some questions. 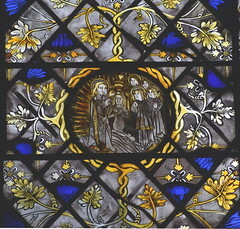 Unusually, it features a Saint on seven of the panels, Christ being on the westwards face. Mortlock dates it to the early 14th century, and the Saints it shows are familiar cults from that time: St Margaret, St Catherine, St Peter and St Paul, and less commonly St George. 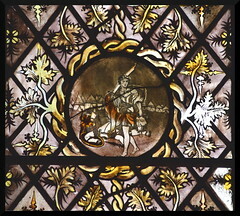 The cult of St George was at its height in the early years of the 14th century. 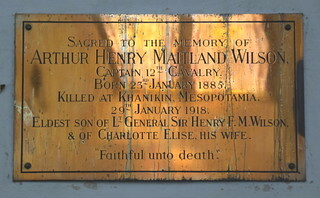 Mortlock describes the font as mutilated, and it certainly isn't looking its best. But I think there is more going on here than meets the eye. Fonts were plastered over in Elizabethan times, and only relief that stood proud of the plaster was mutilated. These are all shallow reliefs, and I do not think they have been mutilated at all. To my eye at least, this stonework appears weathered. I wonder if this font was removed from the church, probably in the mid-17th century, and served an outdoor purpose until it was returned in the 19th century. The story of this church in the 19th century is well-documented. In 1832, as part of his grand tour of Suffolk, David Davy visited, and was pleased to find that the church was at last undergoing repair. 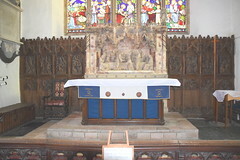 The chancel had been roofless, and the nave used for services. A new Rectory was being built. Who was the catalyst behind all this? His name was Samuel Rickards, and he was Rector here for almost the middle forty years of the 19th century. Roy Tricker notes that he was a good friend of John Henry Newman, the future Cardinal, and they often corresponded on the subject of the pre-Reformation ordering of English churches. It is interesting to think how, at this seminal moment, Rickards might have informed the thought of the Oxford Movement. Sadly, when Newman became a Catholic, Rickards broke off all correspondence with him. During the course of the 1840s and 1850s, Rickards transformed Stowlangtoft church. 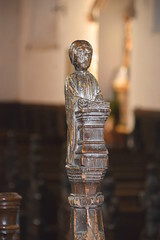 He got the great Ipswich woodcarver Henry Ringham in to restore, replicate and complete the marvellous set of bench ends - Ringham did the same thing at Woolpit, a few miles away. Ringham's work is so good that it is sometimes hard for the inexperienced eye to detect it. 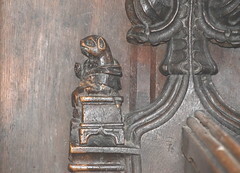 However, as at Woolpit, Ringham only copied animals here, and the weirder stuff is all medieval, and probably dates from the rebuilding of the church. 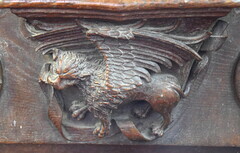 The glory of Stowlangtoft's bench ends is partly the sheer quantity - there are perhaps 60 carvings - but also that there are several unique subjects. 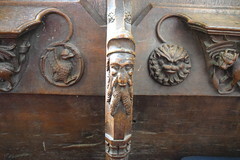 The carvings appear to be part of the same group as Woolpit and Tostock - you will recognise the unicorn, the chained bear, the bull playing a harp, the bird with a man's head, from similar carvings elsewhere. And then hopefully that little alarm bell in your heard should start to go "Hmmmm....." because some of the carvings here are clearly not from the same group. It is hard to believe that the mermaid and the owl, for example, are from the same workshop, or even from the same decade. 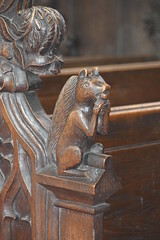 The benches themselves are no clue, as it was common practice in the 19th century to replace medieval bench ends on modern benches, or on medieval benches, or even on modern benches made out of medieval timber (as happened at Blythburgh). Could it be that Samuel Rickards found some of these bench ends elsewhere? Could he have been the kind of person to do a thing like that? Well, yes he could. As Roy Tricker recalls, the medieval roof at the tractarian Thomas Mozley's church at Cholderton in Wiltshire is East Anglian. Rickards acquired it after finding it in storage in Ipswich docks. 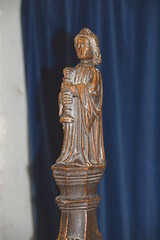 It presumably came from one of the Ipswich churches. In the ferment of the great 19th century restoration of our English churches, there was loads of medieval junk lying around, much of it going begging. But was Samuel Rickards the kind of person to counterfeit his church's medieval inheritance? Well, yes he probably was. 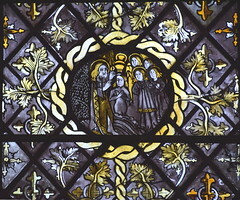 The faux-medieval roundels in the windows of the nave are clearly not medieval at all, but were in fact the work of the young Lucy Rickards, daughter of Samuel Rickards himself. 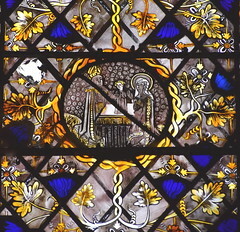 Some are clearly to the young girl's design, and Pevsner notes that others are copied from medieval manuscript illustrations in the British Museum, although the Holy Kinship and Presentation in the Temple roundels at least are very close copies of the Flemish roundels of the same subjects in Nowton church on the other side of Bury St Edmunds. Truly medieval is the vast St Christopher wall-painting still discernible on the north wall. It was probably one of the last to be painted. 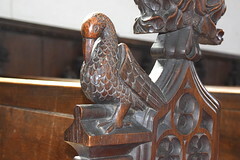 The bench ends are medieval, of course, as is the fine rood-screen dado, albeit repainted. 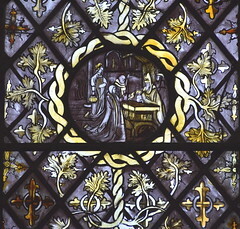 There is even some medieval figure glass in the upper tracery of some of the windows, including St Agnes holding a lamb and four Old Testament prophets. 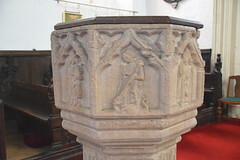 The laughable stone pulpit is Rickard's commission, and the work of William White. What can Rickards have been thinking of? But we step through into the chancel, and suddenly the whole thing moves up a gear. For here are some things that are truly remarkable. In a county famous for its woodwork, the furnishings of Stowlangtoft's chancel are breathtaking, even awe-inspiring. 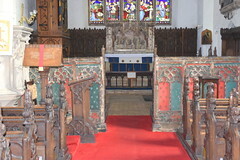 Behind the rood screen dado is Suffolk's most complete set of return stalls. Most striking are the figures that form finials to the stall ends. They are participants in the Mass, including two Priests, two servers and two acolytes. 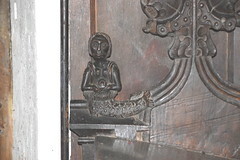 The figure of the Priest at a prayer desk must be one of the best medieval images in Suffolk, and Mortlock thought the stalls the finest in England. 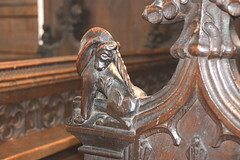 The benches that face eastwards are misericords, and beneath them are wonderful things: angels, lions and wodewoses, evangelistic symbols and crowned heads. 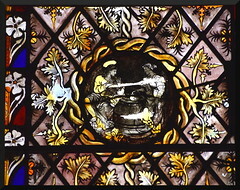 A hawk captures a hare, a dragon sticks out its tongue. Between the seats are weird oriental faces. Now, you know what I am going to ask next. How much of this is from this church originally? 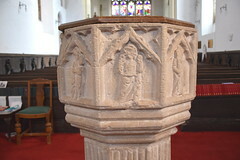 It all appears medieval work, and there is no reason to believe it might not have been moved elsewhere in the church when the chancel was open to the elements. What evidence have we got? 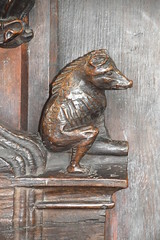 Firstly, we should notice that the only other Suffolk church with such a large number of medieval misericords of this quality is just a mile away, at Norton. I don't ask you to see this as significant, merely to notice it in passing. Secondly, I am no carpenter, but it does look to me as though two sets of furnishings have been cobbled together; the stalls that back on to the screen appear to have been integrated into the larger structure of stalls and desks that front them and the north and south walls. However, if you look closely at the figures of the two Deacons, you will see that they are bearing shields of the Ashfield and Peche families. 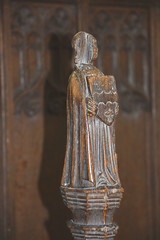 The Ashfield arms also appear on the rood screen, and the Ashfields were the major donors when the church was rebuilt in the 14th century. So on balance I am inclined to think that the greater part of the stall structure was in this church originally from when it was rebuilt. 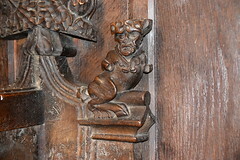 And the misericords? Well, I don't know. But I think they have to be considered as part of the same set as those at Norton. In which case they may have come from the same church, which may have been this one, but may not have been. 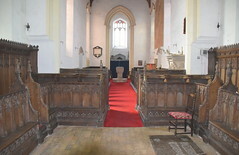 Almost certainly, the stalls at Norton did not come from Norton church, and folklore has it that they were originally in the quire of Bury Abbey. Other remarkable things in St George include FE Howard's beautiful war memorial in the former north doorway, and in the opposite corner of the nave Hugh Easton's unexpectedly gorgeous St George, which serves the same purpose. He's not an artist I usually admire, but it is as good as his work at Elveden. Back up in the chancel is a delightful painted pipe organ which was apparently exhibited at, and acquired from, the Great Exhibition of 1851. But St George at Stowlangtoft is, of course, most famous for the Flemish carvings that flank the rather heavy altarpiece. They were given to the church by Henry Wilson of Stowlangtoft Hall, who allegedly found them in an Ixworth junk shop. 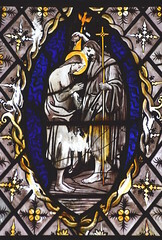 They show images from the crucifixion story, but are not Stations of the Cross as some guides suggest. They date from the 1480s, and were almost certainly the altarpiece of a French or Flemish monastery that was sacked during the French Revolution. The carvings were once brightly painted, and piled up in a block rather than spread out in a line. The niches, and crowning arches above them, are 19th century. One cold winter's night in January 1977, a gang of thieves broke into this locked church and stole them. Nothing more was seen or heard of them until 1982, when they were discovered on display in an Amsterdam art gallery. Their journey had been a convoluted one. Taken to Holland, they were used as security for a loan which was defaulted upon. The new owner was then burgled, and the carvings were fenced to an Amsterdam junk dealer. They were bought from his shop, and taken to the museum, which immediately identified them as 15th century carvings. They put them on display, and a Dutch woman who had read about the Stowlangtoft theft recognised them. The parish instituted legal proceedings to get them back. An injunction was taken out to stop the new owner removing them from the museum. The parish lost the case, leaving them with a monstrous legal bill, but the story has a happy ending. A Dutch businessman negotiated their purchase from the owner, paid off the legal bills, and returned the carvings to Stowlangtoft. Apparently this was all at vast cost, but the businessman gave the gift in thanks for Britain's liberation of Holland from the Nazis. No, thank you, sir. Today, the carvings are fixed firmly in place and alarmed, so they won't be going walkabout again. But a little part of me wonders if they really should be here at all. Sure, they are medieval, but they weren't here originally, and they weren't even in England originally. Wouldn't it be better if they were displayed somewhere safer, where people could pay to see them, and provide some income for the maintenance of the church building? And then, whisper it, when St George is taken on by the CCT they might even be able to leave it open.